Our Littlest Miss, Evie Kate, is turning two this month. Of course, a Happy Second Birthday Party was an order. 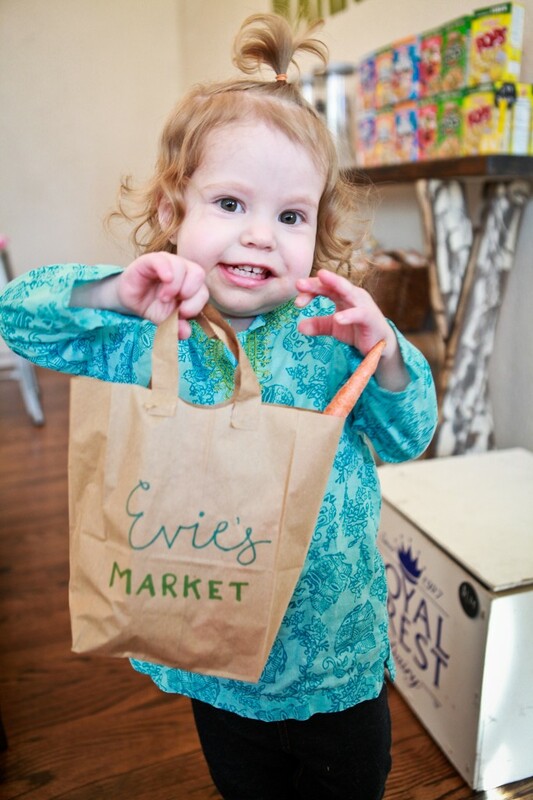 Evie’s very favorite thing is our local grocery store (in the middleeast), “Lulu’s.” And since birthday parties are the perfect chance to celebrate the affections of the teeniest guest of honor, ‘market party’ became our theme. Since the party started at 11:00 am, and since our market had a ‘bakery,’ brunch foods made up most of the menu. We served scones, kolaches, blueberry muffins, mini cinnamon rolls and assorted baked goods. 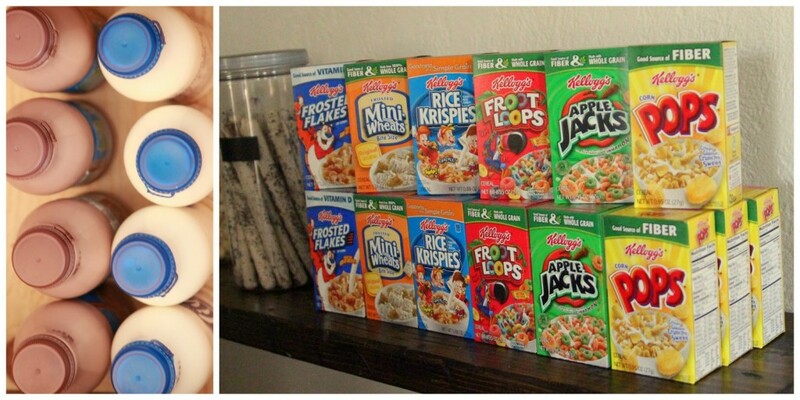 There was also cereal in the market and milk in the milk box, which was a hit with the smaller guests. Peanut butter and huckleberry jam sandwiches from the ‘deli’ rounded out the breakfast fare. 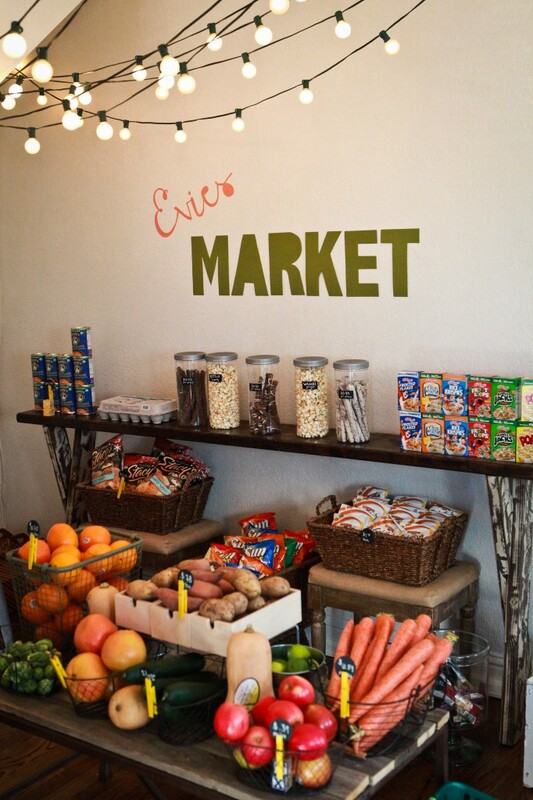 We also had quite the produce section in “Evie’s Market,” so there was a high amount of fruit and vegetable munching as well. It was especially cute to watch Sayla and our nephew Easton and their fondness for the giant carrots! 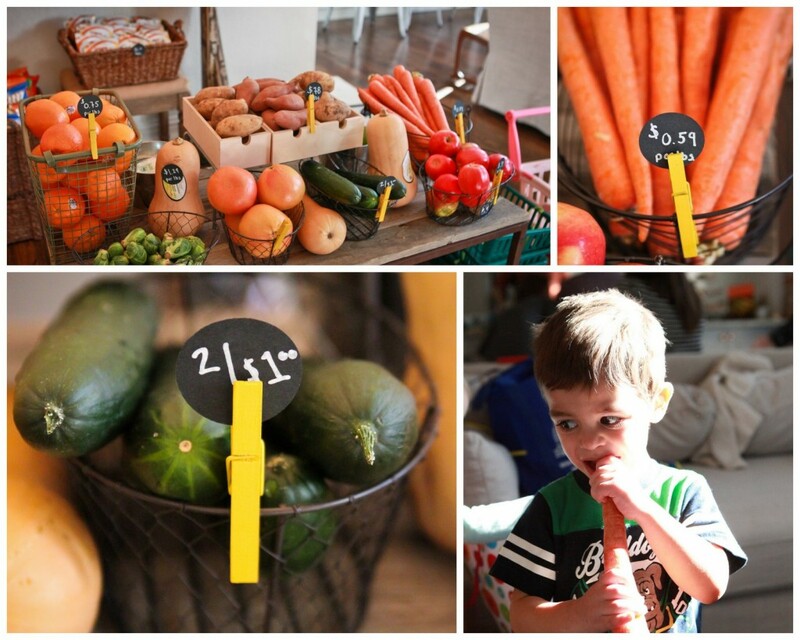 Grocery shopping was the main event at the market party. There was one ‘market’ section full of produce, a section for dried goods (like Pita Chips, chocolate dipped pretzels, Sunchips and mini cereal boxes), a small ‘flower market,’ and a little bakery. 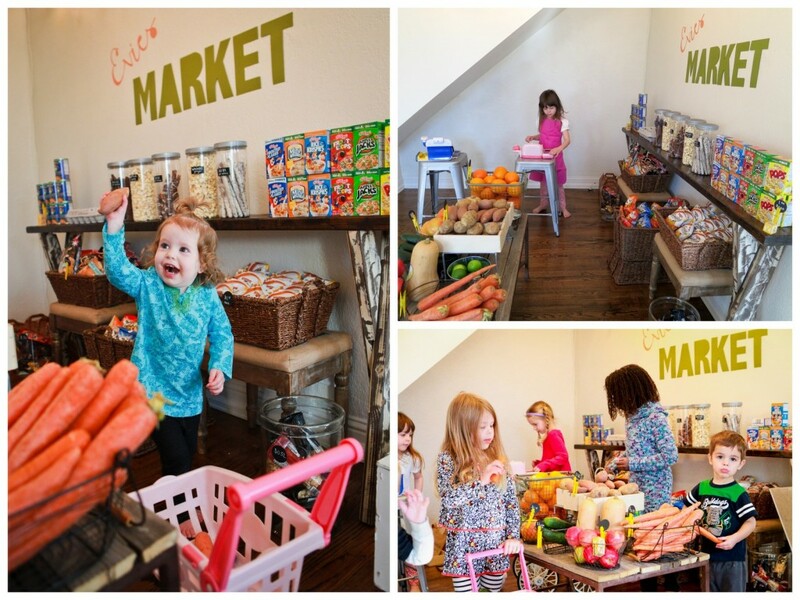 The kids took turns as grocery checkers (complete with aprons) and shoppers (complete with money, carts, shopping baskets). Friends, the shopping was such a hit! The kids played in the market, restocked the shelves, and rebought the items for hours. Seriously, hours. The flower market was also well loved; the kids made the grown ups bouquets of flowers from the flower market throughout the party. It was fabulous. 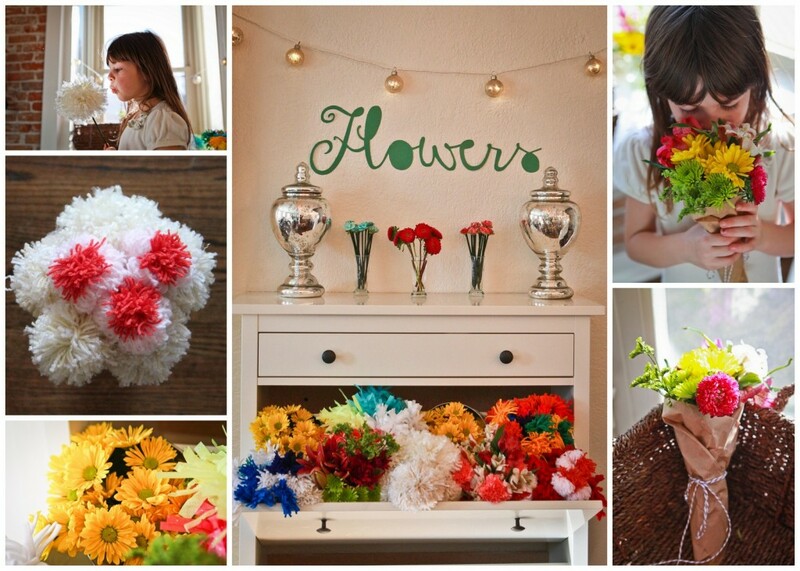 *The tutorial for making the felt mums is here. And here are the other tutorials we used for making the rest of the fabric flowers are here. There were a couple of small cash registers, a mini cart (and two strollers that functioned as carts), green-baskets-turned-shopping-baskets, mini brown bags labeled “Evie’s Market,” actual produce bags with green twisty ties (we grabbed a few extras when we were buying all of the fruit and veggies for the party and then saved all of our bags as we set up the market), and even purses stocked with shopping money. 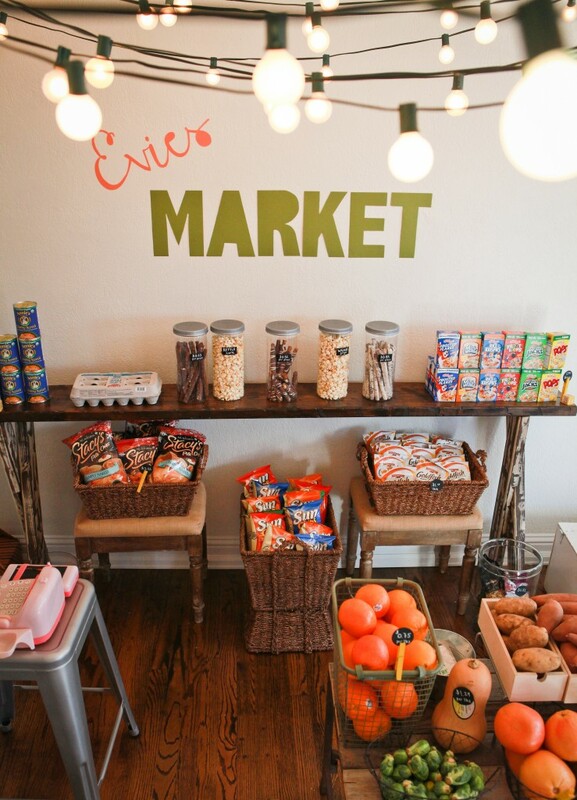 The real-market-items-remade were the kids’ favorite part of this party. To make the living room feel as ‘market-y’ as possible, we strung strands of cafe lights above the shopping areas. 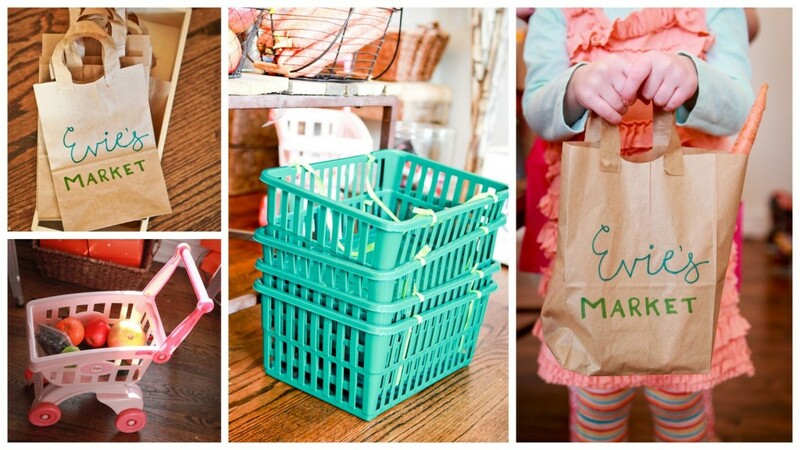 We also set up tiered tables layered with tons of baskets (you know, to give a stacked, farmer’s market-ish vibe). 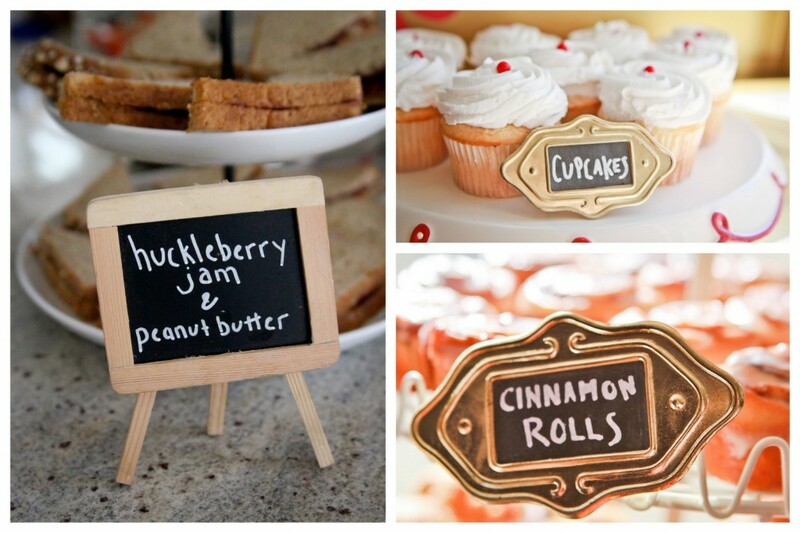 We also gathered as many mini chalkboards as we could find as produce labels to complete the market look. Hilarious side note- we let the kids help us price the food the night before the party. It was a (really, really funny) adventure. You might notice that the ravioli is $4.99 a can, that the pretzels are all priced differently (for variations on the same item). And I don’t think we got a picture of this, but they priced the pineapple at $7.99 (it was $0.99 when I bought it). Funny kids! There were scripty signs denoting “Evie’s Market,” “Flowers,” and “Bakery” (we loosely tried to copy the cursive from Lulu’s signage). As always, the most important thing is whether the guest of honor loves the party. And, y’all, Evie had a blast. She loved shopping, she loved the chaos, and she loved being the center of attention. Happy TWO to my baby girl! What a Fantastic birthday party. Seriously, great idea! This is such a fun idea! I love the activities you guys come up with – you always keep in mind the games kids naturally love to play/pretend. This is the CUTEST idea! I love it SO much! 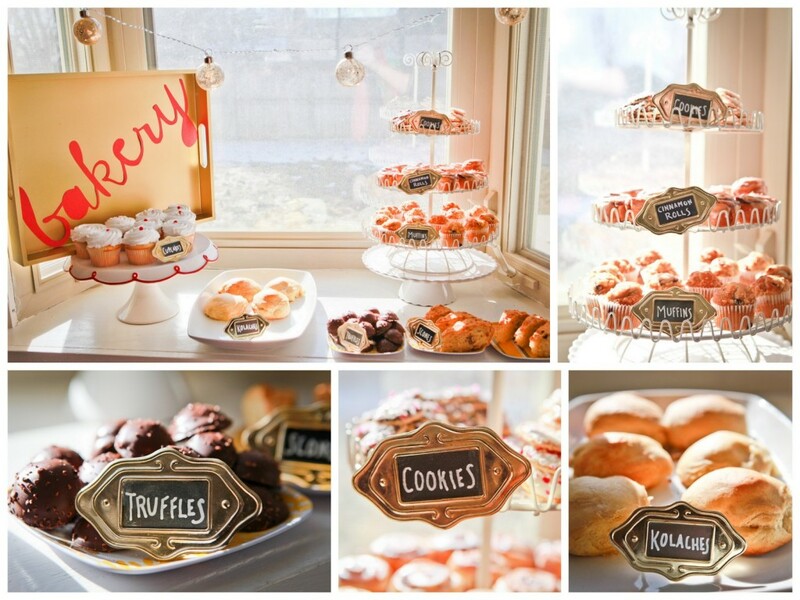 It could easily be adapted to a bridal or baby shower too. Thanks friend- yes, totally adaptable for a shower (wouldn’t that be adorable?). 🙂 Thanks for the kind words! oh my gosh what an adorable party! 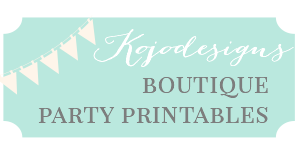 l love your party idea! While looking at your blog I saw your sofa and was wondering if it is a slipcover or not. My sofa is that same style and I’ve had a hard time finding one to fit correctly. Any info would be greatly appreciated! Thanks so much. I will check there! I’m looking forward to your next post! Oh my goodness – seriously, so cute! 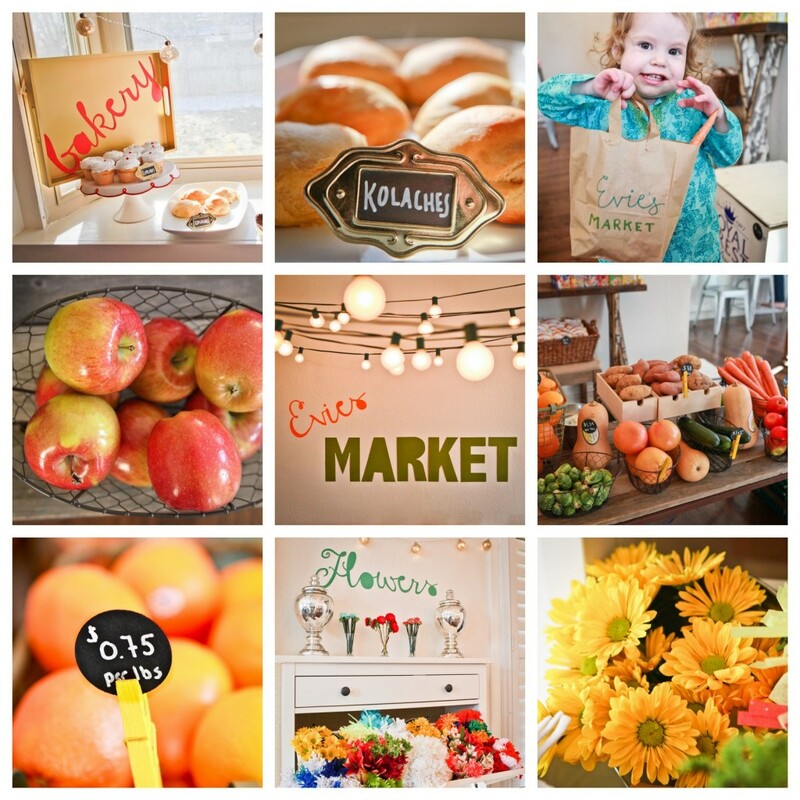 I NEVER would have thought “supermarket” could be a party theme, but this is sooo fun and beautiful! SUPER cute. That Evie girl and the party! What a fun idea. Your parties are the best! This is super adorable! Seriously, I love it! What a hit! STOP IT JORDAN!!! I cant believes that evie is two OR that amazing party! You literally never stop amazing me with your creativity and fun! I am still talking about the table you made into a bed for the pancake breakfast party almost daily. you are amazing. I almost didn’t recognize Evie! I can’t believe how big she is! SO cute! Such a fun and creative party! Miss you guys! Gorgeous and adorable fun! Where did you get the kraft grocery bags from?! I’m on the hunt for them! Thanks Cristina! They were just lunch bags- we trimmed off the top to make ‘handles.’ 🙂 Hope that helps!